I don't think I shared that this special customer was of the male variety. It's not the first time I have sold a Simply Phoebe piece to a boy, but the others have all just been extra large pieces to be worn as scarves. This piece is certainly a statement accessory and I think he pulls it off stunningly. It's edgy and he gives it an incredibly masculine vibe don't you think? A twenty-something visual merchandiser for a chain of tea shops. 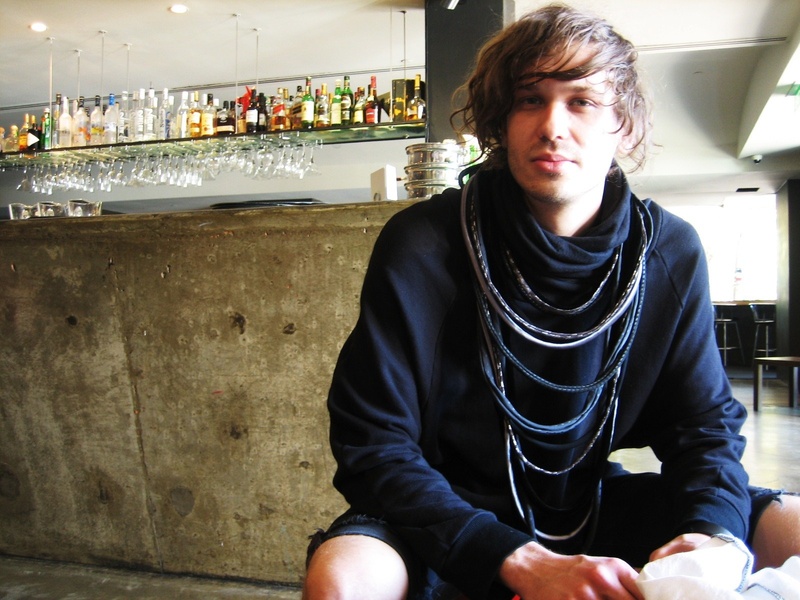 Lives in Sydney but dresses "very Melbourne" - loads and loads of black. He fell in love with the largest piece of Simply Phoebe neckpiece, the varying textures and lengths, at the Precious Material show but it had already been sold. He's been wearing it heaps since he received it and has been getting loads of compliments from people everytime he wears it. He loves it so much that he's thinking of commissioning another piece soon. The likkle girl had also commissioned her own special piece, which I had been very slack in getting to, but finished it off next week and it arrived today. Will pop up the snaps as soon as I get them. More snaps of other new pieces are on the way too.